Dominant negative polypeptides can act as inhibitors by binding to the wild type protein or by titrating an essential ligand. We use high-throughput sequencing of DNA libraries composed of fragments of yeast genes to identify dominant negative polypeptides based on their depletion during cell growth. The method uncovers numerous inhibitory polypeptides for a protein and thus is capable of defining interacting domains with exquisite resolution, even pinpointing individual residues that contact ligands. By comparing the frequencies of fragments present in yeast cells before and after induction, we identified fragments associated with decreased cellular fitness. Remarkably, the method is capable of pinpointing residues corresponding to local minima that may be of special relevance, such as contacting RNA, DNA or small molecules. These exceptional residues can serve as anchor points to select small fragments with dominant negative activity, which may be useful in the design of therapeutics. Given the diversity of possible selection schemes, this method can address such biological questions as protein-based species-incompatibilities, fine-tuning of biological circuits at the protein level, and condition-specific and cell-type-specific protein interactions and structures, in addition to providing highly precise and rapidly acting reagents for functional genomics. Recent efforts to characterize human genomes have identified millions of protein-altering genetic variants. For most of these variants, the phenotypic effect is unknown. Interpreting variants on this scale will require new, higher-throughput methods to evaluate the effect of mutations on function. In collaboration with the Villén lab in Genome Sciences, we are developing a technology to measure the effect of mutations across the whole proteome simultaneously. This technology, called Mistranslation Mutagenesis, addresses the need for high throughput analysis of non-synonymous mutations at the proteome scale. In this method, substitutions are generated in the entire proteome through errors in translation. Because the variants are not genetically encoded, they cannot be quantified by DNA sequencing, but instead can be detected directly at the protein level by mass spectrometry (MS). In a mistranslation mutagenesis experiment, we apply a biochemical selection for protein function to a complex pool of protein variants. We use MS to compare the abundance of each protein variant before and after the selection. If a variant is detrimental for protein function, peptides that contain that variant will be depleted after selection. Using a system developed by the Phizicky lab at the University of Rochester, we engineered serine tRNAs that accumulate in cells conditionally. We made all possible anticodon mutants of this serine tRNA and transformed them into yeast in a pool, and identified sequences that cause toxicity when the tRNA accumulates. Using mass spectrometry, we showed that these tRNAs cause serine misincorporation at their cognate codon sites. We have subjected proteins from yeast expressing these mistranslating serine tRNAs to selections for solubility and thermal stability. We measured the effect of serine substitutions at multiple amino acid sites in hundreds of proteins, and identified and validated positions where substitution causes loss of function. We are developing selections that interrogate other aspects of protein function, such as protein-protein interaction. Zimmerman (2018) Nucleic Acids Res. 24, 410-422. In a second approach, we use conditional expression of a tRNA synthetase. Transcription of mutant tRNAs with altered codon specificity in S. cerevisiae cannot be regulated directly because eukaryotic tRNA promoter elements are internal to the gene. However, the cognate synthetase genes, as protein-coding genes, can be placed under the control of an inducible promoter. Furthermore, synthetases and tRNAs derived from a cross-kingdom (archaeal or bacterial) species typically do not interact with yeast synthetases and tRNAs. We are seeking to harness these characteristics of the translation machinery to generate systems for inducible expression of an E. coli synthetase with constitutive expression of the cognate tRNA; this tRNA carries mutations to the anticodon that result in mistranslation. In the absence of induction, the E. coli tRNA will be expressed in yeast but will not be charged without its synthetase. When synthetase expression is induced, the tRNA will be charged, resulting in proteome-wide mistranslation. Ultimately, we will expand this inducible mistranslation system to a large suite of synthetase and tRNA pairs to compare the functional effects of all missense substitution types. ​We are also developing a mistranslation reporter system to accelerate our discovery of new orthogonal tRNA and synthetase pairs that do not interact with the native yeast translational machinery. Each tRNA gene from three cross-kingdom species (E. coli, M. mazei and M. jannascii), all of which have been used to generate orthogonal pairs, was synthesized with an amber stop anticodon. This pool of tRNAs will be expressed with one of each of the tRNA synthetases from the respective species. We will determine the ability of each synthetase to charge tRNAs from the pool in yeast via suppression of an amber stop codon at a flexible position in GFP. Orthogonal pairs that suppress the amber stop will be isolated by FACS, and subsequently will be tested for proteome-wide mistranslation by mutating the amber stop anticodon in the tRNA to recognize a sense codon for another amino acid. Genome-wide association studies have identified many variants associated with complex traits, but these variants frequently explain only a small fraction of a trait’s heritability. Hypotheses to explain this “missing heritability” include the additive action of many individually small-effect variants or significant gene-by-gene and gene-by-environment interactions. We are using the yeast mating pathway as a model complex trait to experimentally measure the impact of additive and epistatic genetic variation on mating. We performed individual deep mutational scanning experiments to profile the effects of thousands of mutations in three mating pathway genes encoding physically interacting proteins: STE5 (scaffold protein), STE11 (MAPKKK), and STE7 (MAPKK). For each gene, we transformed the corresponding yeast deletion strain with a library of ~50,000 variants, carried out a selection for mating, and sequenced the population of variants before and after selection by high-throughput sequencing. Variants that lead to impaired mating function are depleted in the population after the selection, while variants that lead to wild-type mating are enriched. From these experiments, we identified mutations in all three genes across the full spectrum of effect sizes, from complete loss-of-function at key residues to many neutral to slightly deleterious mutations. From the mutational scanning data, we selected 100 mutations in each gene with small to intermediate effects on mating and constructed libraries with combinations of these mutations found in two genes (10,000 combinations per gene pair). We transformed these libraries into yeast deleted for both genes to perform selections to measure the effect on mating of each double mutant. From these experiments, we will determine how well different models of genetic interaction predict the behavior of double mutants and comprehensively assess the relative impact of additive and epistatic interactions. Ste12 is a transcription factor that regulates mating and invasive growth in Saccharomyces cerevisiae. Single amino acid changes in the DNA-binding domain of Ste12 can shift the preference of yeast cells toward either mating or invasion. In parallel, the in vitro DNA-binding preference of Ste12 variants shifted compared to that of the wild-type protein. We sought to precisely compare the alternative Ste12-DNA binding modes of Ste12 and its variants by examining their genomic binding profiles in vivo. We designed a high-throughput experiment based on the “calling cards” approach (Wang et al. 2007 Genome Res. 17:1202). A transposase is fused with a transcription factor of interest, such that when the transcription factor binds to DNA, the transposase recruits the cognate transposon and directs its insertion into the genome near to where it binds. A barcode within the transposon labels the visit of the transcription factor to that location. To test whether the traits due to variant Ste12 proteins result from altered DNA-binding patterns, we chose nine variants and captured their genomic targets through a PiggyBac transposon-based “calling cards” approach. We included variants that can invade but cannot mate (K149E, K146D, K152L, A160P), as well as variants that can mate but cannot invade (D162C, K150I, K175E). Others of these variants behave as hyper-invasive (K146D, K152L, K150A). Genome-wide insertion patterns and gene targets were revealed for Ste12 wild-type and the nine variants. Glyphosate, the active ingredient in Roundup, is a widely used, broad spectrum herbicide. It inhibits the enzyme 5-enolpyruvylshikimate-3-phosphate synthase (EPSPs), which is part of the shikimate pathway and needed to produce tyrosine, tryptophan, and phenylalanine. Thus, glyphosate inhibits the growth of sensitive plants. We intend to develop a glyphosate-resistant variety of cassava, an important staple crop in sub-Saharan Africa. Cassava cultivation is often constrained by weed proliferation, as more than 50% of cassava production costs are allocated to weeding. Multiple single and double amino acid substitutions in EPSPs are known to confer glyphosate resistance, but all result in a slower-growing plant. Our goal is to identify one or more mutations in the cassava EPSPs that confer resistance to glyphosate, but which retain activity similar to that of the wild-type enzyme. We generated a library of EPSPs variants using error-prone PCR, and introduced these into an E. coli strain lacking its native EPSPs gene. In this background, complementation by the cassava EPSPs is required for growth in minimal media. We then performed a growth-based selection in various concentrations of glyphosate to identify mutations that improved glyphosate resistance (Figure 1). Using high-throughput DNA sequencing, we determined the fitness conferred by each EPSPs variant based on its change in frequency before and after glyphosate selection. We measured the growth of the best-performing variants in our E. coli host, and identified one mutation that improves the growth of both the WT EPSPs as well as of the T181L P185A double mutant, but it fails to improve resistance in another glyphosate-resistant variant, EPSPs T181I P185M. We have preliminary data that suggest that this mutation improves glyphosate resistance in Cassava plants. We have also identified a second mutation that improves resistance of both WT and the T181L P185A double mutant. It appears to act additively with the first mutation that confers glyphosate resistance, improving resistance even further. As a rapid method to assess glyphosate resistance in a plant host, we are now testing combinations of these mutations in Camelina sativa. We hope to observe growth of C. sativa when complemented with our engineered variants of Cassava EPSPs compared to wild type Cassava EPSPs. Figure 1. Experimental design to identify EPSPs variants with increased activity and glyphosate resistance. An error-prone PCR library was introduced into E. coli lacking EPSPs (aroA). These were plated on minimal media plates with various concentrations of glyphosate. After colonies were observed, the plates were scraped, EPSPs plasmid collected, and EPSPs gene prepared for deep-sequencing analysis with Nextera tagmentation. Dominant negative polypeptides can act as inhibitors by binding to the wild type protein or by titrating an essential ligand. In nature, they frequently arise from truncated fragments of a wild type protein. Given this origin of natural dominant negatives, one rich source for finding dominant negatives in the laboratory might be short fragments of a protein that occupy key binding sites on the full-length protein. Additionally, since many proteins contain intramolecular regulatory domains, short protein fragments that relieve autoinhibitory function and lead to enhanced activation of the wild type protein might be identified as dominant negatives. Using the inherent toxicity of human Src protein kinase expression in yeast, we screened tens of thousands of Src fragments for their capacity to relieve Src toxicity (Fig. 1a). By deep sequencing the fragments before and after selection, we identify fragments that are either enriched or depleted during selection (Fig 1b). Enriched fragments represent potential inhibitors of Src, while depleted fragments represent potential activators of Src. The most enriched and most depleted fragments are being assessed for their ability to inhibit or activate the phosphotransferase activity of Src kinase. We hope to use this method to identify variant-specific inhibitors of Src and other human protein kinases that might be used as therapeutics. Figure 1. A. Selection strategy to find polypeptide inhibitors of Src kinase. B. Distribution of enrichment scores for fragments before and after selection. Antibiotic resistance is a growing threat to public health. This resistance, coupled with a dearth of new antibiotics, makes development of new antibiotics of critical importance. Many antibiotics derive from microbial pathways that synthesize complex natural products, and engineering these pathways to produce new antibiotics is an exciting prospect. We are using such a strategy to produce variants of the antibacterial lasso peptides Microcin J25, Klebsidin, and Acinetodin in E. coli. Named for their distinct lariat knot structure, each peptide is produced by three biosynthetic enzymes that modify and export a ribosomally-synthesized precursor peptide. 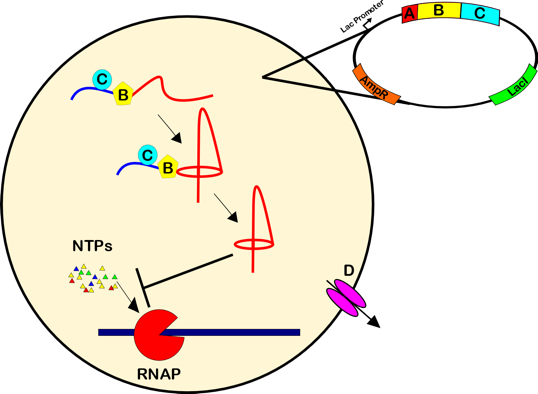 The mature lasso peptide halts bacterial growth by inhibiting the uptake of nucleoside triphosphates (NTPs) into RNA polymerase. We plan to use an assay that relies on cellular growth to measure the activity of many lasso peptide variants in parallel, and to identify lasso peptide variants that overcome a known resistance mutation. Figure 1. Lasso peptides Acinetodin, MccJ25, and Klebsidin are antibiotics that act by inhibiting transcription by obstructing the nucleoside triphosphate (NTP) uptake channel of RNA polymerase. Four proteins, denoted A, B, C, and D are involved in producing and exporting these peptides. The A protein encodes a leader peptide followed by the unprocessed core peptide. The B and C proteins post-translationally modify the A protein precursor to form the mature lasso structure. Finally, the D protein exports the lasso peptide outside of the cell. In our assays, the D gene was omitted to enable self-toxicity. ​When the A, B, and C proteins for lasso peptide biosynthesis are expressed in E. coli, mature lasso peptides accumulate in the cell and inhibit growth. By expressing a library of lasso peptide variants, each within a single cell, and using deep sequencing to count the frequency of each variant before and after selection, we can obtain functional data for thousands of lasso peptides in one experiment. Using this assay, we hope to generate functional scores of each single amino acid mutation in Microcin J25, Klebsidin, and Acinetodin. These data will provide us an understanding of each lasso peptide’s tolerance to mutation and help us characterize the sequence of each peptide based on antibacterial activity. In addition, we hope to study how mutagenesis of the lasso peptides can combat antibiotic resistance. By performing the same selections in an E. coli strain resistant to the wild type lasso peptides, we hope to identify variants that overcome this resistance. Together, these studies will provide a framework for understanding the prospects of lasso peptide engineering and identifying novel peptide-based antibiotics. Figure 2. A. Wild Type lasso peptides Klebsidin and Microcin J25 successfully inhibit growth of the cell after induction with IPTG. B. 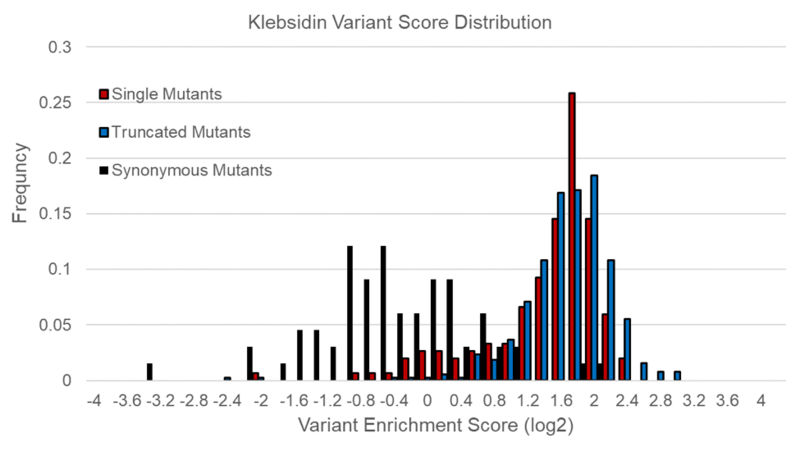 Distribution of variant enrichment scores of the Klebsidin variant peptides normalized to the wild type score (zero). The truncated mutants show positive growth scores, indicating non-functional peptides. The single mutants show a slightly bimodal distribution with most non-functional, and a small population having neutral scores. The synonymous distribution is wider than anticipated, and indicates the selection requires optimization to move synonymous scores closer to zero. These data, while not yet ideal, show the selection is successfully separating Klebsidin variants based on antibacterial activity.